Framed on three sides by forested hills, Marigot Bay offers coastal seclusion and calm, with sophisticated touristic developments and access to some of the most important regional highlights. 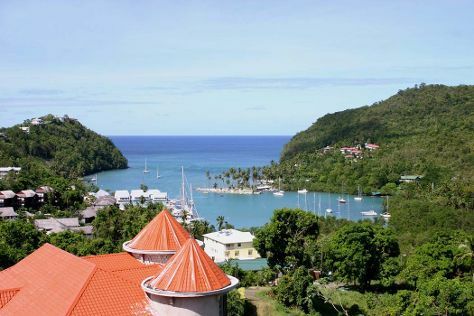 Tucked away in its scenic coastal location, the main village of Marigot Bay fans out from the marina, with most of the main attractions, eateries, and places to stay located close to the water. The water plays a large role in Marigot Bay holidays, with yacht journeys, scuba diving excursions, and snorkeling jaunts a hit with visitors. Marigot Bay is in Castries Quarter. Our St. Lucia online trip builder combines visitor reviews with your personal interests to make an itinerary informed by experts, but tailored to suit your style. Private vacation rentals dominate the scene in Marigot Bay, with villas and condos lining the waterfront from all sides. If you're looking for something all-inclusive, look to stay at one of the many high-end beach resorts nestled up against the bay. Stay on the south side of the bay for great hillside views.